When I talk about ‘social selling’ I often talk about being authentic and conversational. But there is also an art to what you say and post online. And the same process can be said of anything we post online really. Even that Facebook status update – you want people to click like right? OF course you do. That’s validation that your message, whatever it is, was read, heard and accepted by the crowd. Back to me writing this post. I wanted to write about “words and phrases that sell” because while I may use them more naturally now, in the beginning it was definitely difficult to come up with the right ones. 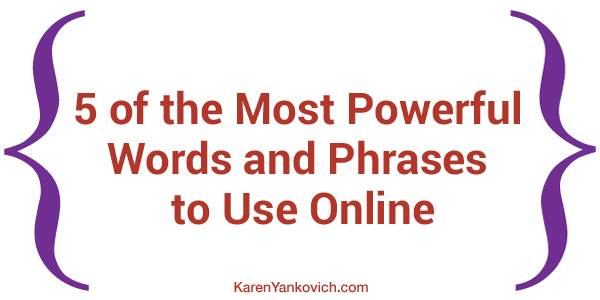 5 words or phrases that have power to SELL what you are talking about online. 5 main words or phrases that have more power to actually SELL what you are talking about online. Number One: This first one is a ‘twofer” – first, the word YOU and second, your prospects name. These rank high from research that measures emotion evoked from words. Why? We are adapted to enjoying the sound of our own name, and the word you means it is about us, and we like that. Do you have a popular product or service? Maybe you haven’t gotten that far with customers yet, but it’s a hit amongst your family and friends – that’s great too! The reason best-seller is such a powerful and proven word is because it shows social proof that the product or service your customer wants to buy is worth their time and money. That’s a big deal and you can understand that right? Just think of your own online buying habits. Any site that mentions a “Best -Seller” category, or best-seller in the description copy has more of my attention. I don’t have time to cull through all the varied lists of products and offers, I just want to know which one is the best. And I take best-seller seriously as proven by others who want the same product or service as me. So make sure you have the word “best-seller” in your product description, in your tweet, and in your post, to help drive people right where they already want to go. Number Three: Words that say “This won’t be difficult” when you read my post, enter my contest, or sign up for my online course. The reason? Because we all want a quick fix. I’d like to stress that I work with a lot of clients who want a quick fix to their social media marketing and I have to reiterate that patience and consistency truly win the race. But in my copy for social media posts, on my website, etc, I try to showcase the quick tips that can really make a difference. Take a look at my social media quick tip that I post regularly on YouTube. What product or service do you offer that you can break down into some simple step-by-step quick tips for your prospective clients? They will see a quick result if they apply it and then begin to trust that you are an expert in your field. And that is a result worth waiting for. Number Four: Use words that show exclusivity or newness. As humans we always like to know that we are the first. At least some of us do! But this need for exclusivity and interest in the new is fairly common among most people, even if you aren’t an early adopter. Use these words in your headlines, bullets, subject lines as well as your calls to action so people know right away what they are getting, that they could be part of an exclusive crowd, and that this is a new offer never before seen. Make doubly sure when you are launching a new product or service that you use these words. “Because I said so,” never really worked for me as a parent and this phrase probably wouldn’t work to encourage your prospective clients to sign up, buy, enroll or any other action you wanted them to take. But research has shown that adding the word because with a reason makes people 30% more likely to agree to your request! Here is the study to read for yourself – it’s actually very interesting! The takeaway here: When you are asking your reader, prospective client, or follower to do anything: sign up, subscribe, buy, comment, by adding a reason, no matter how small, silly or foolish that reason may seem, you are 3 times more likely to get them to do it, so add a reason! Will you join my group? Because it will make you smarter. Comment on my post! Because then I will feel less lonely. Can you email me back one reason why you would rather not buy at this time? Because then I can make my product/service better. Which word or phrase will you try today? Still feeling stuck? Read this guy’s funny post about 1500 words and phrases that sell. While I cannot guarantee the veracity of his claims, the phrases he listed did trigger some chuckles and creative ideas and that is always worth the time. Karen – five very good suggestions. It’s amazing how these techniques have worked for centuries. I looked at Brian’s post about different headlines. Is anyone else getting tired of these titles? They’ve become too common for me.